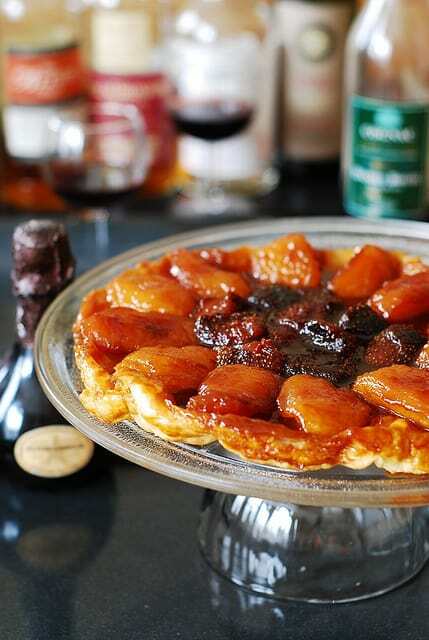 Strawberry Apple Tarte Tatin – beautiful, delicious French dessert made with puff pastry. 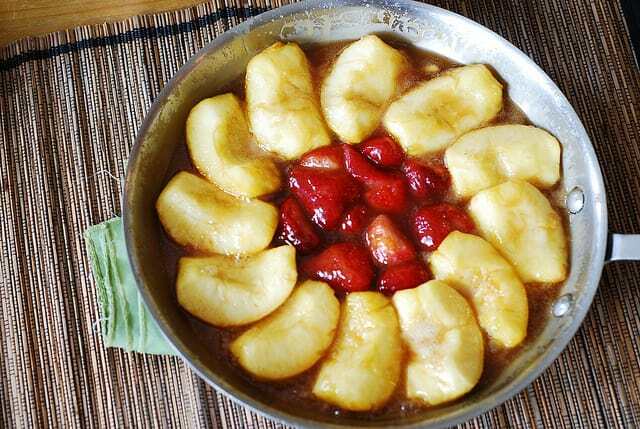 Apples and strawberries are caramelized by being cooked on medium-high heat in sugar and butter (caramel sauce) for about 20 minutes. The apples absorb the caramel flavor, the caramel sauce darkens and thickens alongside the apples. Then, all this goodness is baked on top of puff pastry sheet. Making Strawberry Apple Tarte Tatin has long been on my to-do list, ever since I saw this recipe on Orangette and Smitten Kitchen. 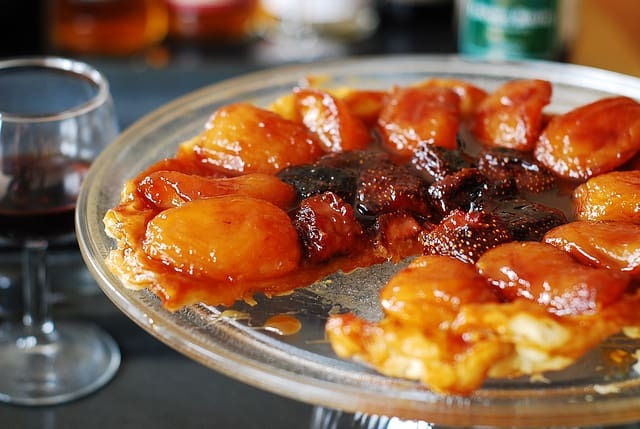 I became even more inclined to make this apple tarte tatin after reading that Molly of Orangette had superior results making it with a particular All-Clad stainless steel pan (9 inches upper diameter across the top, 7 inches lower diameter across the bottom of the pan) – the same pan I own in my kitchen. 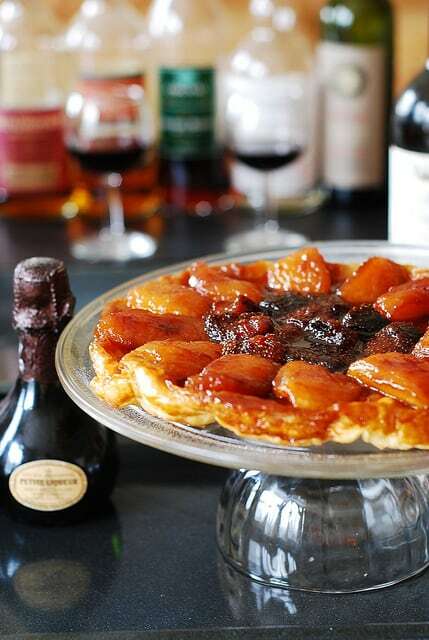 As though having the exact same skillet was not a good enough reason to make this apple tarte tatin, my husband was set on opening a bottle of Sauternes, a French dessert wine, which pairs beautifully with this caramel strawberry apple tart. By the way, Molly of Orangette suggests serving this dessert with a glass of Tokaji, an excellent Hungarian sweet wine. Both types of wine are great options. 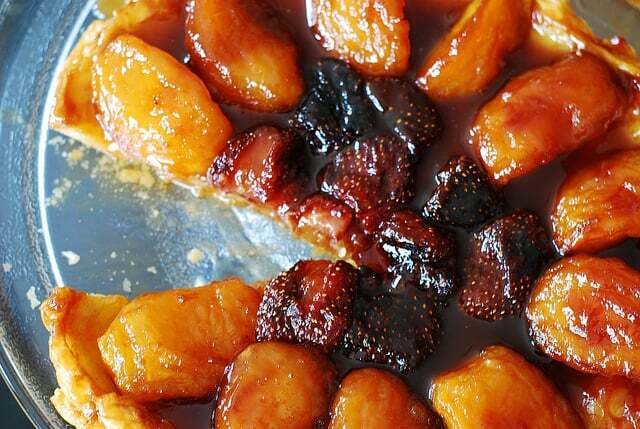 I’ve made this apple tarte tatin twice now, first as originally described, with apples only. Second time, I added whole strawberries, which not only made a beautiful presentation, but also added a completely new spectrum of flavor to the caramel apples. 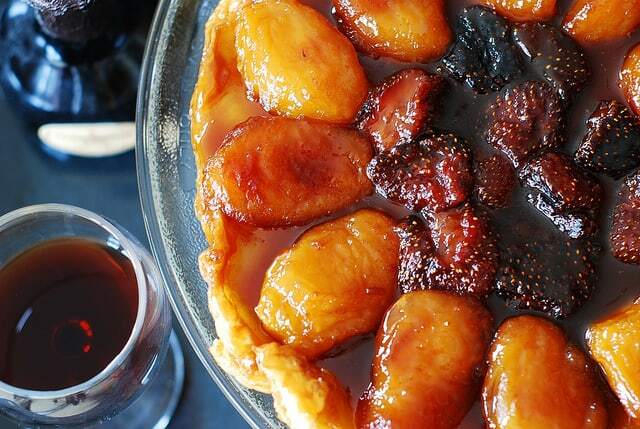 Apple tarte tatin is absolutely my new favorite fruit dessert. What makes caramel strawberry apple tart very special is that the apples and the strawberries are cooked on medium-high heat in sugar and butter (caramel sauce) for about 20 minutes. The apples absorb the caramel flavor, and, because you cook them on high enough heat, any extra moisture produced by the apples while they are cooking evaporates. Also, as you cook on high heat, the caramel sauce darkens and thickens alongside the apples. 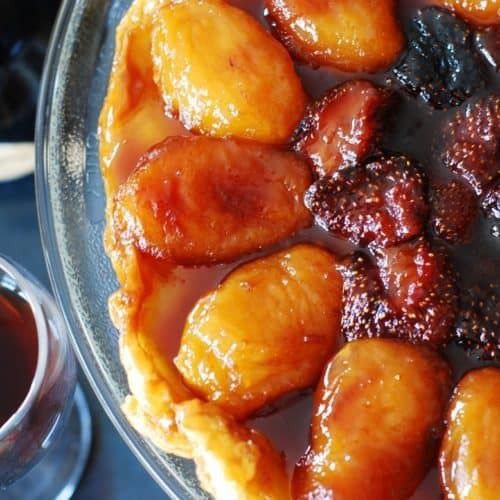 While you cook apples and strawberries for 20 minutes on medium-high heat, make sure to not to overcook the apples – they should still be somewhat firm after these 20 minutes of cooking in caramel sauce, because you will still have 30 minutes of baking time ahead with the puff pastry on top. 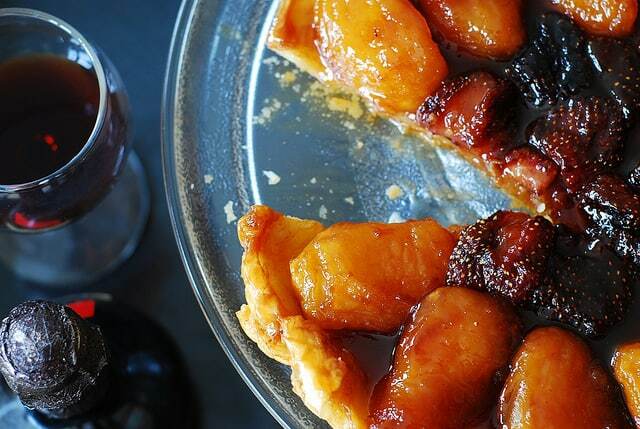 Not only does this apple tarte tatin smells good while you’re cooking, it’s delicious, goes well with fruity wines, and looks quite presentable. Some step-by-step photos are below. For complete recipe, scroll down below the photos. See how caramel coats the spoon? 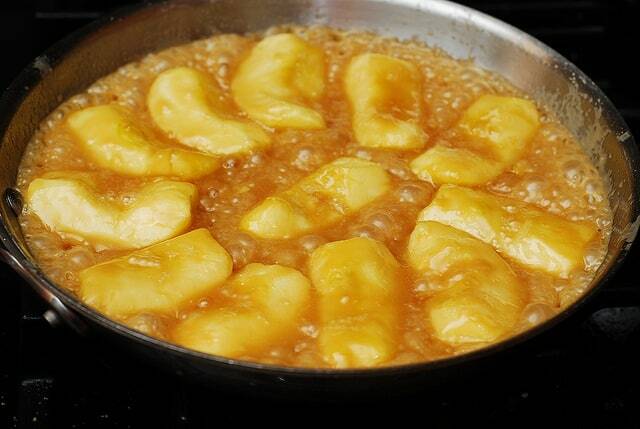 See how caramel bubbles when you cook it? 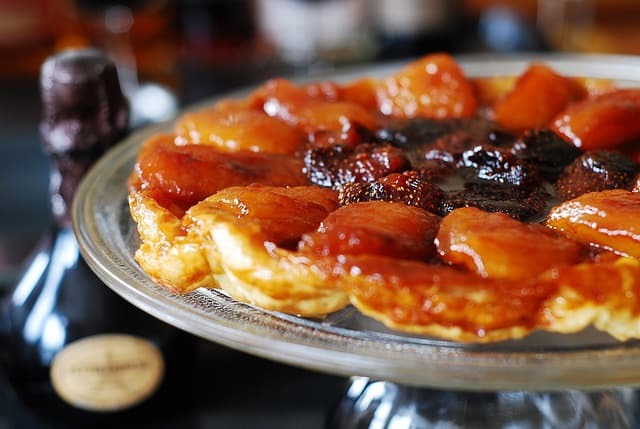 Strawberry Apple Tarte Tatin - beautiful, delicious French dessert made with puff pastry. This tasty Caramel Apple Tart is made by caramelizing apples (and strawberries) first, and then baking them on top of puff pastry sheet. 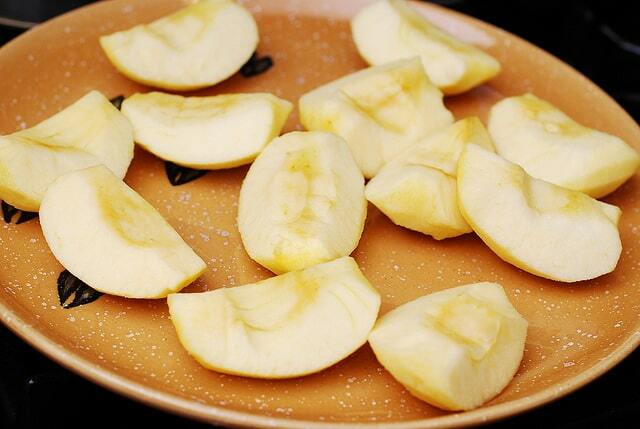 Peel and quarter the apples, toss the apple quarters in a large bowl with the lemon juice and 1/3 cup of the sugar. Set aside for 20 minutes to release the juices. 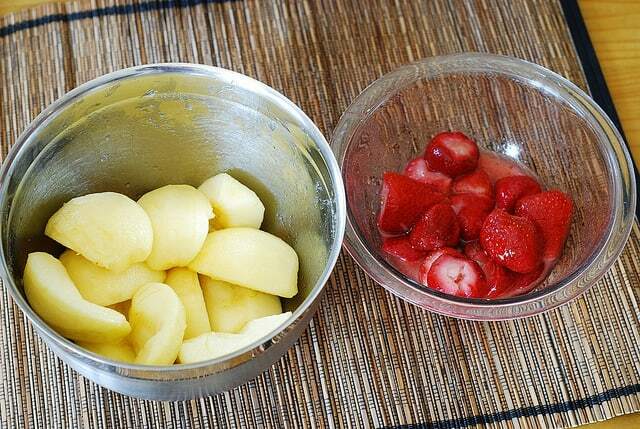 In a separate bowl, toss strawberries with 2 tablespoons sugar, let them sit for 20 minutes as well. 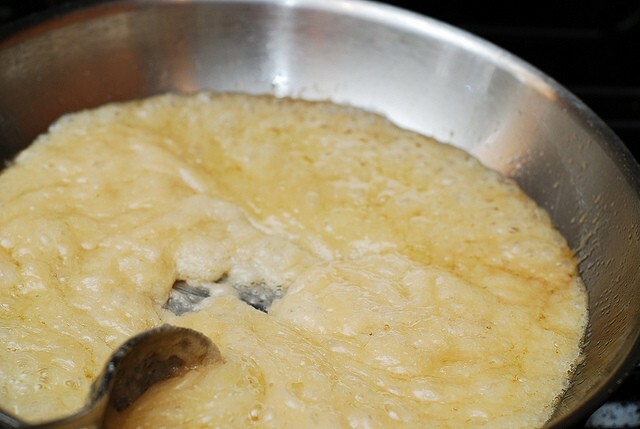 Melt 6 tablespoons of butter in an oven-proof skillet. I used an All-Clad stainless steel pan (9 inches upper diameter across the top, 7 inches lower diameter across the bottom of the pan). Add 1 cup of sugar and 3-4 tablespoons of apple-lemon juices. 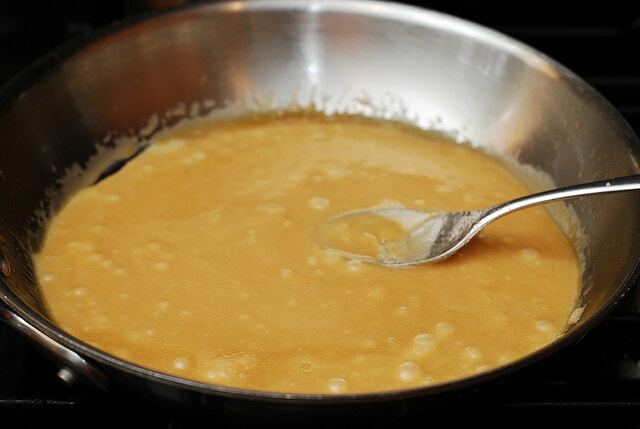 Cook the mixture on medium-low heat, stirring constantly, for about 15 minutes, until mixture thickens, becomes smooth, and turns pale caramel color. 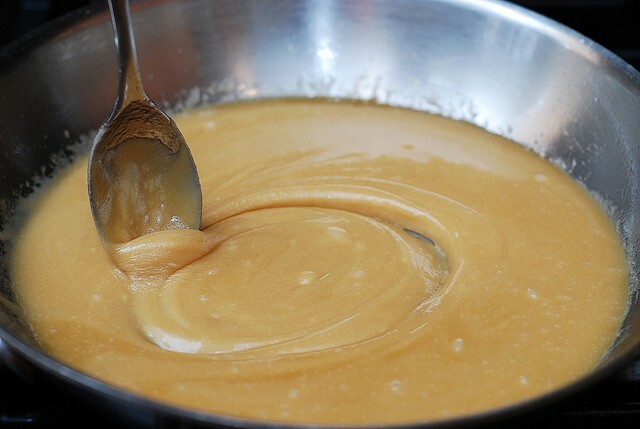 In other words, when you transfer the spoon with the caramel mixture to the plate – the caramel coating the spoon should harden around the spoon almost immediately. At this point, remove the skillet from the heat. 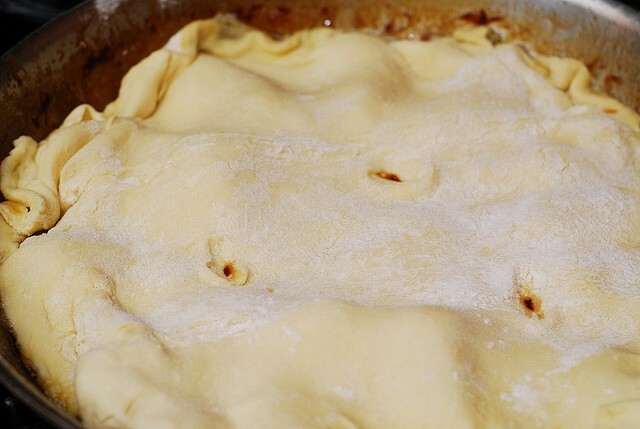 Add apple quarters, arranging them rounded-side down in a decorative pattern in a circle along the side of the skillet. Top the apples with the remaining 2 tablespoons of butter, sliced. 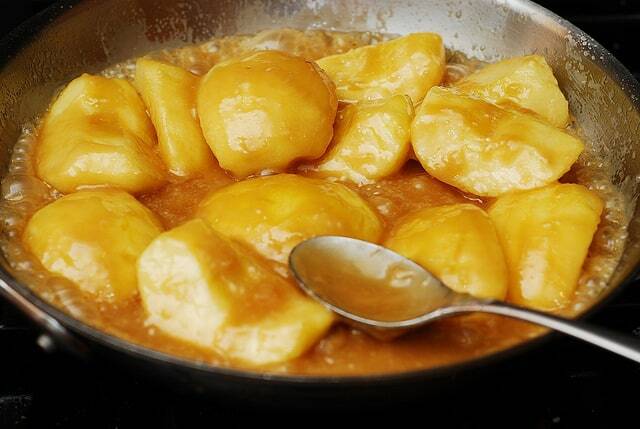 Cook the apples over medium-low heat for about 10 minutes, occasionally spooning the bubbling caramel liquid over them. You can also move apples around and then place them back in the same decorative pattern. 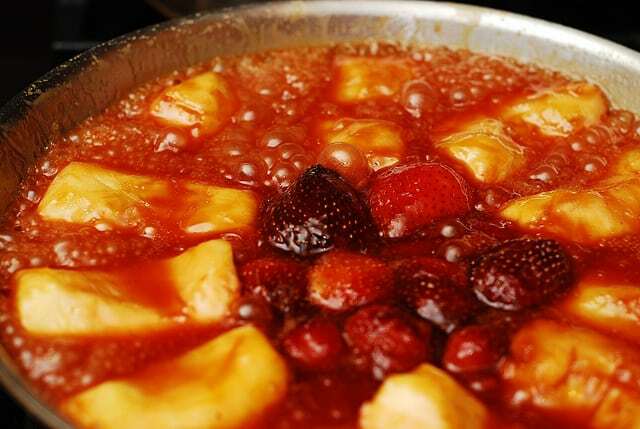 Add strawberries in the middle of the pattern and continue cooking both strawberries and apples for 15-20 more minutes on medium high heat, constantly stirring the liquid, pouring it over apples and strawberries, until the caramel sauce reduces and thickens. The sauce will be boiling with bubbles and should turn thick and of darker color. When you place some of that liquid on the spoon, it should be pretty thick and not runny. 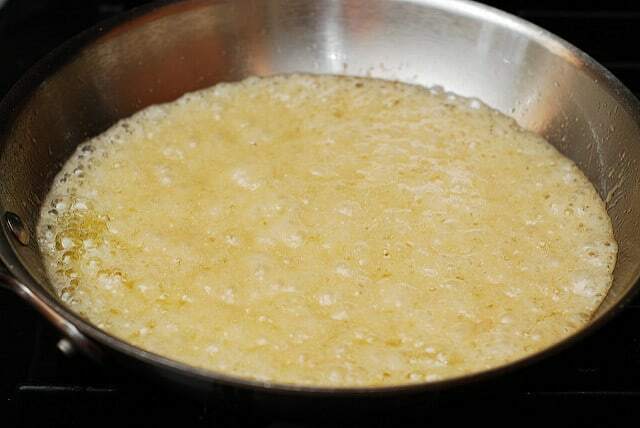 Remove the skillet from the heat, let the liquid stop bubbling. 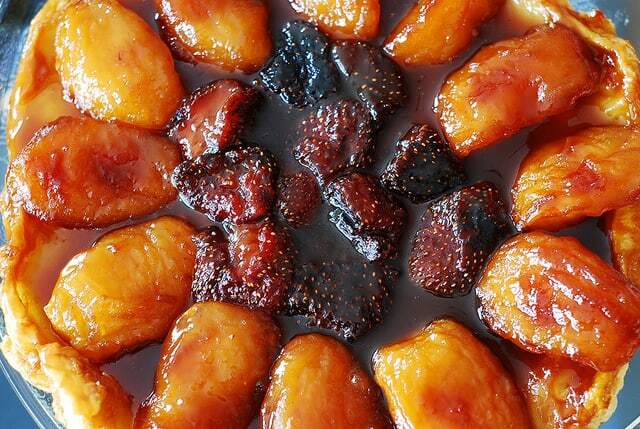 A thick dark (but not too dark) caramel sauce should be completely coating the apples and the strawberries. At this point, it’s ready to be placed in the oven. 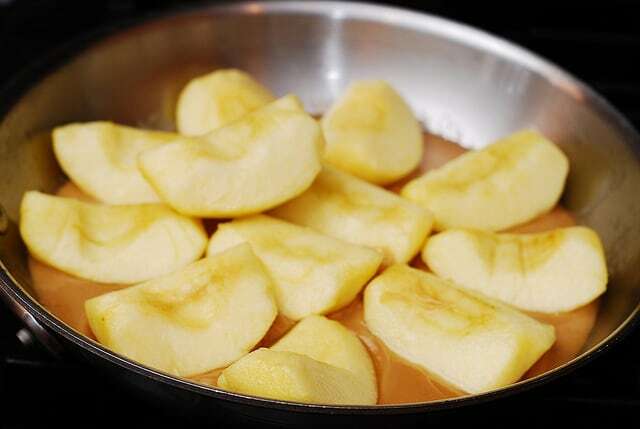 Apples should be slightly firm, not be too soft and the liquid should not turn dark brown. 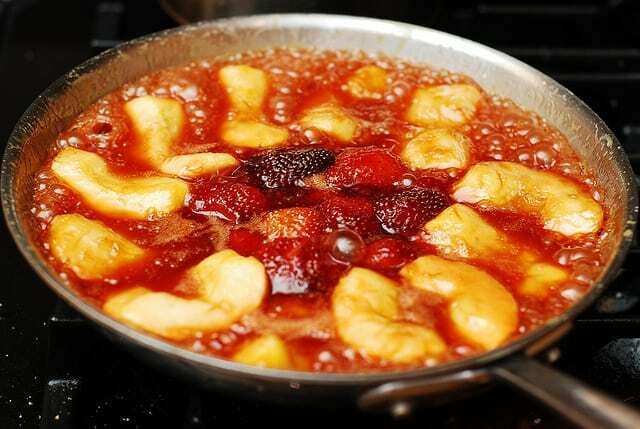 Note: while you cook apples and strawberries in the sauce, strawberries especially produce a lot of liquid, so make the caramel sauce reduces to a thick consistency that’s not runny. 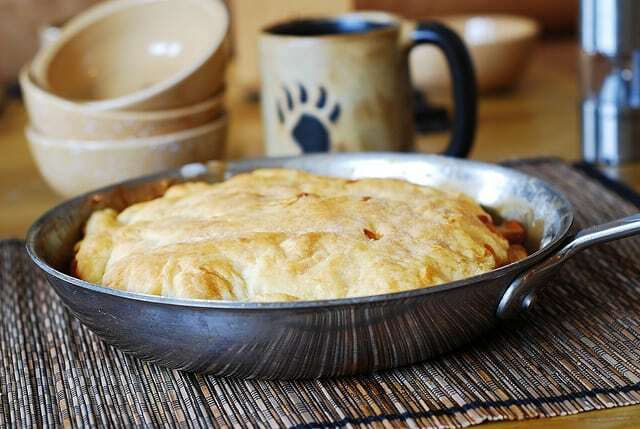 On a floured surface, roll the puff pastry sheet and cut out a circle about 10 inches in diameter, about 1/2 inch wider all around than the skillet. 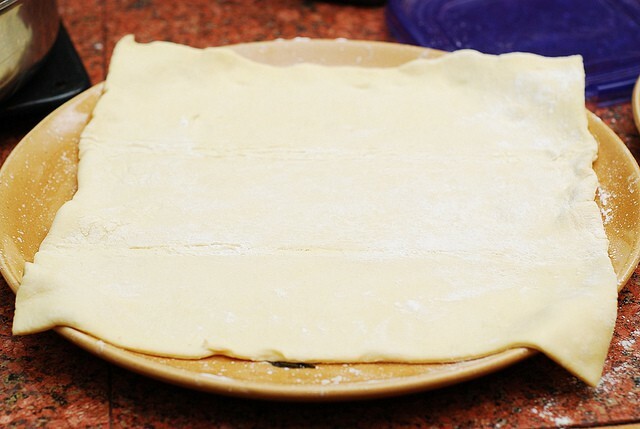 Make 4 cuts in the pastry for breathing during baking. 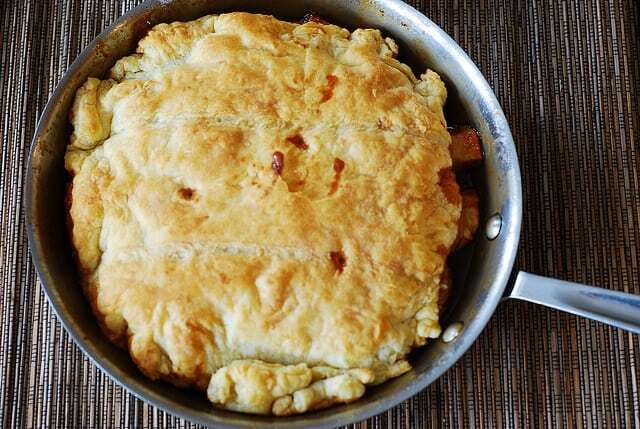 Place the puff pastry circle over the apples and the strawberries in the skillet, tucking the overlapping portion down between the apples and the inside of the pan. Place the skillet in the oven, and bake for about 30-35 minutes, until the pastry has puffed up, and is dry and golden brown. 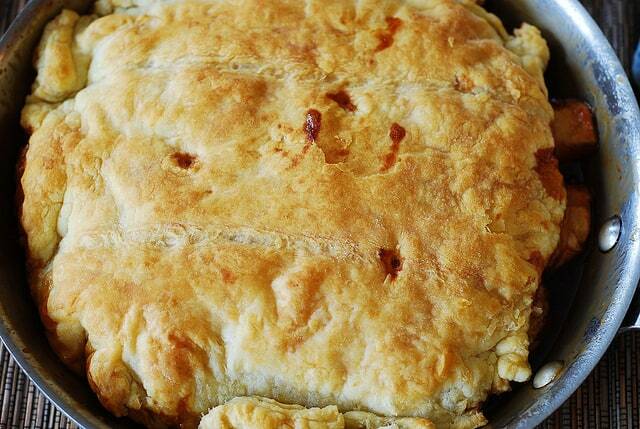 Remove the skillet from the oven, and let it to rest for a minute or two. 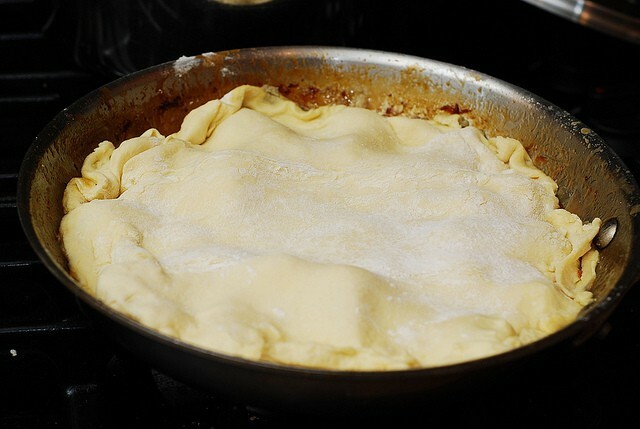 Place a serving platter upside-down over the skillet and invert the tart onto the platter. Be very careful not to burn yourself as the skillet is very hot. Rearrange any apple slices that may have slipped or stuck to the skillet. Adapted from Smitten Kitchen and also newer version of this recipe on Smitten Kitchen, and also Orangette.